Here’s an excerpt from my latest article on WhatCulture.com, all about the Prequel to Doctor Who Series 9: The Doctor’s Meditation. I had hoped this article would be posted up two days ago, when perhaps a great many more people might have been interested, but better late than never, eh? I’m not sure what the delay was caused by, but I suspect fans can now find a place to view the actual Prequel – when I wrote this, there weren’t any online sources. Hah! So much for trying to get a scoop! Still, here’s the beginning of the article. As always, it’s followed by a link you can click to easily read the rest of the write-up. It contains a full transcript of the Prequel along with what I thought of it. So, obviously, beware spoilers! For those who went to cinemas on the 15th of September 2015 to see the 3-D showings of the two-part Series 8 finale, Dark Water and Death in Heaven, there was a six and a half minute treat at the end. After being exhorted to remove their 3-D glasses, fans were treated to the much-anticipated Series 9 Prequel, The Doctor’s Meditation. 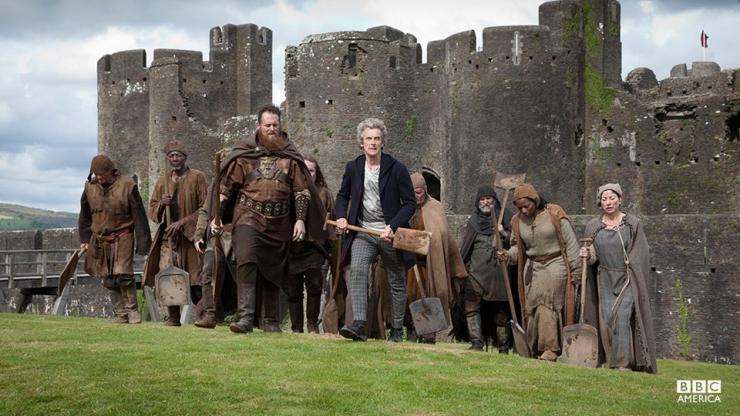 This short film was directed by Ed Bazalgette and written by Steven Moffat, and it acted as a prequel leading into the first episode of the new series, “The Magician’s Apprentice”. The prequel was shown in Russian, Canadian, Danish and US cinemas, but nowhere else – including the UK! So, as it turned out, very few Doctor Who fans got to see it! So, what’s the Prequel like? Here’s a full run-down with all of the dialogue and analysis of what it all means. It won’t come as a surprise to fans that there’s very little in the way of actual meditating going on in this Prequel; the Twelfth Doctor is too beset by worry right now to sit still for long. Really, it’s an excuse for a lot of very funny jokes and a serious moment at the end. For a blow-by-blow account, read on!